All libraries are the GPU versions, though they also run on the CPU. Data scientists use various tools to complete these tasks. It can be quite time consuming to find the appropriate versions of the software, and then to download, compile, and install these versions. The Data Science Virtual Machine for Linux can ease this burden substantially. Use it to jump-start your analytics project. It enables you to work on tasks in various languages, including R, Python, SQL, Java, and C++. The Azure SDK included in the VM allows you to build your applications by using various services on Linux for the Microsoft cloud platform. In addition, you have access to other languages like Ruby, Perl, PHP, and node.js that are also pre-installed. There are no software charges for this data science VM image. You pay only the Azure hardware usage fees that are assessed based on the size of the virtual machine that you provision. More details on the compute fees can be found on the VM listing page on the Azure Marketplace. A CentOS image is also available, with many of the same tools as the Ubuntu image. A Windows image is available as well. Before you can create a Data Science Virtual Machine for Linux, you must have an Azure subscription. To obtain one, see Get Azure free trial. Navigate to the virtual machine listing on the Azure portal. You may be prompted to login to your Azure account if you are not already signed in. Click Create (at the bottom) to bring up the wizard. Name: Name of your data science server you are creating. VM Disk Type: Choose Premium SSD if you prefer a solid-state drive (SSD). Otherwise, choose Standard HDD. User Name: First account sign-in ID. Password: First account password (you can use SSH public key instead of password). Subscription: If you have more than one subscription, select the one on which the machine is to be created and billed. You must have resource creation privileges for this subscription. Resource Group: You can create a new one or use an existing group. Location: Select the data center that is most appropriate. Usually it is the data center that has most of your data, or is closest to your physical location for fastest network access. Select one of the server types that meets your functional requirement and cost constraints. Select an NC or ND-class VM for GPU based VM instances. The Products available by region page lists the regions with GPUs. In most cases, you can just use the default values. To consider non-default values, hover over the informational link for help on the specific fields. The provisioning should take about 5 minutes. The status of the provisioning is displayed on the Azure portal. After the VM is created, you can sign in to it by using SSH. Use the account credentials that you created in the Basics section of step 3 for the text shell interface. On Windows, you can download an SSH client tool like Putty. If you prefer a graphical desktop (X Windows System), you can use X11 forwarding on Putty or install the X2Go client. The X2Go client performed better than X11 forwarding in testing. We recommend using the X2Go client for a graphical desktop interface. Download and install the X2Go client for your client platform from X2Go. Host: The host name or IP address of your Linux Data Science VM. Login: User name on the Linux VM. SSH Port: Leave it at 22, the default value. Session Type: Change the value to XFCE. Currently the Linux VM only supports XFCE desktop. Media tab: You can turn off sound support and client printing if you don't need to use them. Shared folders: If you want directories from your client machines mounted on the Linux VM, add the client machine directories that you want to share with the VM on this tab. After you sign in to the VM by using either the SSH client or XFCE graphical desktop through the X2Go client, you are ready to start using the tools that are installed and configured on the VM. On XFCE, you can see applications menu shortcuts and desktop icons for many of the tools. The Ubuntu DSVM runs JupyterHub, a multi-user Jupyter server. To connect, browse to https://your-vm-ip:8000 on your laptop or desktop, enter the username and password that you used to create the VM, and log in. Many sample notebooks are available for you to browse and try out. The Microsoft Cognitive Toolkit is an open source, deep learning toolkit. Python bindings are available in the root and py35 Conda environments. It also has a command-line tool (cntk) that is already in the PATH. For more information, see the CNTK section of GitHub, and the CNTK wiki. Caffe is a deep learning framework from the Berkeley Vision and Learning Center. It is available in /opt/caffe. Examples can be found in /opt/caffe/examples. Some example notebooks are available in JupyterHub. H2O is a fast, in-memory, distributed machine learning and predictive analytics platform. A Python package is installed in both the root and py35 Anaconda environments. An R package is also installed. To start H2O from the command-line, run java -jar /dsvm/tools/h2o/current/h2o.jar; there are various command line options that you may like to configure. The Flow Web UI can be accessed by browsing to http://localhost:54321 to get started. Sample notebooks are also available in JupyterHub. Keras is a high-level neural network API in Python that is capable of running on top of TensorFlow, Microsoft Cognitive Toolkit, or Theano. It is available in the root and py35 Python environments. MXNet is a deep learning framework designed for both efficiency and flexibility. It has R and Python bindings included on the DSVM. Sample notebooks are included in JupyterHub, and sample code is available in /dsvm/samples/mxnet. The NVIDIA Deep Learning GPU Training System, known as DIGITS, is a system to simplify common deep learning tasks like managing data, designing and training neural networks on GPU systems, and monitoring performance in real time with advanced visualization. DIGITS is available as a service, called digits. Start the service and browse to http://localhost:5000 to get started. DIGITS is also installed as a Python module in the Conda root environment. TensorFlow is Google's deep learning library. It is an open source software library for numerical computation using data flow graphs. TensorFlow is available in the py35 Python environment, and some sample notebooks are included in JupyterHub. Theano is a Python library for efficient numerical computation. It is available in the root and py35 Python environments. Torch is a scientific computing framework with wide support for machine learning algorithms. It is available in /dsvm/tools/torch, and the th interactive session and luarocks package manager are available at the command line. Examples are available in /dsvm/samples/torch. PyTorch is also available in the root Anaconda environment. Examples are in /dsvm/samples/pytorch. R is one of the most popular languages for data analysis and machine learning. If you want to use R for your analytics, the VM has Microsoft R Server (MRS) with the Microsoft R Open (MRO) and Math Kernel Library (MKL). The MKL optimizes math operations common in analytical algorithms. MRO is 100 percent compatible with CRAN-R, and any of the R libraries published in CRAN can be installed on the MRO. MRS gives you scaling and operationalization of R models into web services. You can edit your R programs in one of the default editors, like RStudio, vi, or Emacs. If you prefer using the Emacs editor, it has been pre-installed. The Emacs package ESS (Emacs Speaks Statistics) simplifies working with R files within the Emacs editor. To launch R console, you just type R in the shell. This takes you to an interactive environment. To develop your R program, you typically use an editor like Emacs or vi, and then run the scripts within R. With RStudio, you have a full graphical IDE environment to develop your R program. There is also an R script for you to install the Top 20 R packages if you want. This script can be run after you are in the R interactive interface, which can be entered (as mentioned) by typing R in the shell. Anaconda Python is installed with Python 2.7 and 3.5 environments. The 2.7 environment is called root, and the 3.5 environment is called py35. This distribution contains the base Python along with about 300 of the most popular math, engineering, and data analytics packages. To invoke a Python interactive session, just type python in the shell. The Anaconda distribution also comes with a Jupyter notebook, an environment to share code and analysis. The Jupyter notebook is accessed through JupyterHub. You sign in using your local Linux user name and password. The Jupyter notebook server has been pre-configured with Python 2, Python 3, and R kernels. There is a desktop icon named "Jupyter Notebook" to launch the browser to access the notebook server. If you are on the VM via SSH or X2Go client, you can also visit https://localhost:8000/ to access the Jupyter notebook server. Continue if you get any certificate warnings. Port 8000 is opened in the firewall by default when the VM is provisioned. We have packaged sample notebooks--one in Python and one in R. You can see the link to the samples on the notebook home page after you authenticate to the Jupyter notebook by using your local Linux user name and password. You can create a new notebook by selecting New, and then the appropriate language kernel. If you don't see the New button, click the Jupyter icon on the top left to go to the home page of the notebook server. A standalone instance of Apache Spark is preinstalled on the Linux DSVM to help you develop Spark applications locally first before testing and deploying on large clusters. You can run PySpark programs through the Jupyter kernel. When you open Jupyter, click the New button and you should see a list of available kernels. The "Spark - Python" is the PySpark kernel that lets you build Spark applications using Python language. You can also use a Python IDE like PyCharm or Spyder to build you Spark program. Since, this is a standalone instance, the Spark stack runs within the calling client program. This makes it faster and easier to troubleshoot issues compared to developing on a Spark cluster. A sample PySpark notebook is provided on Jupyter that you can find in the "SparkML" directory under the home directory of Jupyter ($HOME/notebooks/SparkML/pySpark). If you are programming in R for Spark, you can use Microsoft R Server, SparkR or sparklyr. You can stop the Hadoop related services when you don't need them by running systemctl stop hadoop-namenode hadoop-datanode hadoop-yarn A sample demonstrating how to develop and test MRS in remote Spark context (which is the standalone Spark instance on the DSVM) is provided and available in the /dsvm/samples/MRS directory. You have a choice of several code editors. This includes vi/VIM, Emacs, PyCharm, RStudio, and IntelliJ. IntelliJ, RStudio and PyCharm are graphical editors, and need you to be signed in to a graphical desktop to use them. These editors have desktop and application menu shortcuts to launch them. VIM and Emacs are text-based editors. On Emacs, we have installed an add-on package called Emacs Speaks Statistics (ESS) that makes working with R easier within the Emacs editor. More information can be found at ESS. LaTex is installed through the texlive package along with an Emacs add-on auctex package, which simplifies authoring your LaTex documents within Emacs. SQuirrel SQL, a graphical SQL client, has been provided to connect to different databases (such as Microsoft SQL Server, and MySQL) and to run SQL queries. You can run this from a graphical desktop session (using the X2Go client, for example). To invoke SQuirrel SQL, you can either launch it from the icon on the desktop or run the following command on the shell. For more information, see SQuirrel SQL. bcp: The bcp utility bulk copies data between an instance of Microsoft SQL Server and a data file in a user-specified format. The bcp utility can be used to import large numbers of new rows into SQL Server tables, or to export data out of tables into data files. To import data into a table, you must either use a format file created for that table, or understand the structure of the table and the types of data that are valid for its columns. For more information, see Connecting with bcp. sqlcmd: You can enter Transact-SQL statements with the sqlcmd utility, as well as system procedures, and script files at the command prompt. This utility uses ODBC to execute Transact-SQL batches. For more information, see Connecting with sqlcmd. There are some differences in this utility between Linux and Windows platforms. See the documentation for details. There are libraries available in R and Python to access databases. In R, the RODBC package or dplyr package allows you to query or execute SQL statements on the database server. In Python, the pyodbc library provides database access with ODBC as the underlying layer. Azure command-line interface: The Azure CLI allows you to create and manage Azure resources through shell commands. To invoke the Azure tools, just type azure help. For more information, see the Azure CLI documentation page. Microsoft Azure Storage Explorer: Microsoft Azure Storage Explorer is a graphical tool that is used to browse through the objects that you have stored in your Azure storage account, and to upload and download data to and from Azure blobs. You can access Storage Explorer from the desktop shortcut icon. You can invoke it from a shell prompt by typing StorageExplorer. You need to be signed in from an X2Go client, or have X11 forwarding set up. Azure Libraries: The following are some of the pre-installed libraries. Python: The Azure-related libraries in Python that are installed are azure, azureml, pydocumentdb, and pyodbc. With the first three libraries, you can access Azure storage services, Azure Machine Learning, and Azure Cosmos DB (a NoSQL database on Azure). The fourth library, pyodbc (along with the Microsoft ODBC driver for SQL Server), enables access to SQL Server, Azure SQL Database, and Azure SQL Data Warehouse from Python by using an ODBC interface. Enter pip list to see all the listed libraries. Be sure to run this command in both the Python 2.7 and 3.5 environments. R: The Azure-related libraries in R that are installed are AzureML and RODBC. Java: The list of Azure Java libraries can be found in the directory /dsvm/sdk/AzureSDKJava on the VM. The key libraries are Azure storage and management APIs, Azure Cosmos DB, and JDBC drivers for SQL Server. You can access the Azure portal from the pre-installed Firefox browser. 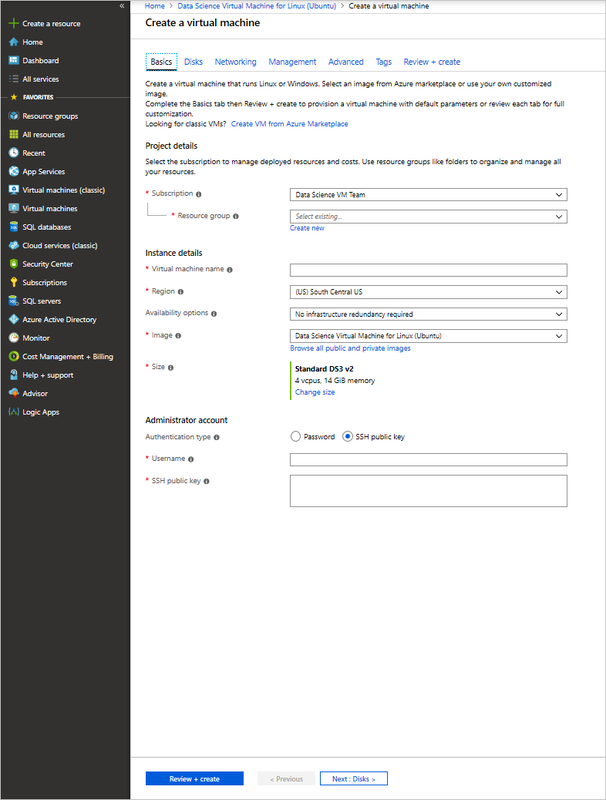 On the Azure portal, you can create, manage, and monitor Azure resources. Azure Machine Learning is a fully managed cloud service that enables you to build, deploy, and share predictive analytics solutions. You build your experiments and models from Azure Machine Learning Studio. It can be accessed from a web browser on the data science virtual machine by visiting Microsoft Azure Machine Learning. After you sign in to Azure Machine Learning Studio, you have access to an experimentation canvas where you can build a logical flow for the machine learning algorithms. You also have access to a Jupyter notebook hosted on Azure Machine Learning and can work seamlessly with the experiments in Machine Learning Studio. Operationalize the machine learning models that you have built by wrapping them in a web service interface. This enables clients written in any language to invoke predictions from the machine learning models. For more information, see the Machine Learning documentation. You can also build your models in R or Python on the VM, and then deploy it in production on Azure Machine Learning. We have installed libraries in R (AzureML) and Python (azureml) to enable this functionality. For information on how to deploy models in R and Python into Azure Machine Learning, see Ten things you can do on the Data science Virtual Machine (in particular, the section "Build models using R or Python and Operationalize them using Azure Machine Learning"). These instructions were written for the Windows version of the Data Science VM. But the information provided there on deploying models to Azure Machine Learning is applicable to the Linux VM. Vowpal Wabbit: A fast online learning algorithm. xgboost: A tool that provides optimized, boosted tree algorithms. Rattle: An R-based graphical tool for easy data exploration and modeling. Python: Anaconda Python comes bundled with machine learning algorithms with libraries like Scikit-learn. You can install other libraries by using the pip install command. LightGBM: A fast, distributed, high-performance gradient boosting framework based on decision tree algorithms. Here is some additional information about the first three machine learning tools in the list. Vowpal Wabbit is a machine learning system that uses techniques such as online, hashing, allreduce, reductions, learning2search, active, and interactive learning. There are other, larger demos in that directory. For more information on VW, see this section of GitHub, and the Vowpal Wabbit wiki. This is a library that is designed and optimized for boosted (tree) algorithms. The objective of this library is to push the computation limits of machines to the extremes needed to provide large-scale tree boosting that is scalable, portable, and accurate. It is provided as a command line as well as an R library. To use this library in R, you can start an interactive R session (just by typing R in the shell), and load the library. A .model file is written to the directory specified. Information about this demo example can be found on GitHub. For more information about xgboost, see the xgboost documentation page, and its GitHub repository. Rattle (the R Analytical Tool To Learn Easily) uses GUI-based data exploration and modeling. It presents statistical and visual summaries of data, transforms data that can be readily modeled, builds both unsupervised and supervised models from the data, presents the performance of models graphically, and scores new data sets. It also generates R code, replicating the operations in the UI that can be run directly in R or used as a starting point for further analysis. Now a graphical interface opens up with a set of tabs. Here are the quick start steps in Rattle needed to use a sample weather data set and build a model. In some of the steps below, you are prompted to automatically install and load some required R packages that are not already on the system. If you don't have access to install the package in the system directory (the default), you may see a prompt on your R console window to install packages to your personal library. Answer y if you see these prompts. A dialog pops up, asking you if you like to use the example weather data set. Click Yes to load the example. Click Execute to build a decision tree. Click Draw to display the decision tree. Click the Forest radio button, and click Execute to build a random forest. Click the Risk radio button, and click Execute to display two Risk (Cumulative) performance plots. Click the Export button to save the R script file named weather_script.R to the home folder. You can exit Rattle and R. Now you can modify the generated R script, or use it as it is to run it anytime to repeat everything that was done within the Rattle UI. Especially for beginners in R, this is an easy way to quickly do analysis and machine learning in a simple graphical interface, while automatically generating code in R to modify and/or learn. The Data science on the Data Science Virtual Machine for Linux walkthrough shows you how to perform several common data science tasks with the Linux Data Science VM provisioned here. Explore the various data science tools on the data science VM by trying out the tools described in this article. You can also run dsvm-more-info on the shell within the virtual machine for a basic introduction and pointers to more information about the tools installed on the VM. Learn how to build end-to-end analytical solutions systematically by using the Team Data Science Process. Visit the Azure AI Gallery for machine learning and data analytics samples that use the Azure AI services.